In my last post, I looked at the status of several wild parrot species which have been negatively impacted by habitat loss, hunting, and other human activities. This week in my reading I investigated the other side of the equation: invasive parrot populations around the world. To be perfectly honest, although I had been vaguely aware of this issue in the US, I had no idea about the true extent of their presence outside of their native ranges. Or how complicated the status of invasive parrot species could be- yellow-crested cockatoos, for example, are considered Critically Endangered by the IUCN, but are a non-native species in Singapore where they exploit exotic plants and native seeds and fruits, potentially reducing the supply for native birds and possibly lowering plant recruitment by grinding seeds and eating immature fruit (Neo 2012)- so is it a good thing or a bad thing that they have established a population in the city? Another complication has been determining whether or not a population has become established and is reproducing. Parrots are long-lived animals and do not have frequent or large clutches, so it can be difficult to figure out if the parrots you see in the same place year after year are new birds from a stable, reproducing population or are the same birds simply living out their long lives (Runde et al. 2007). This appears to be partially dependent on whether the birds were captive-reared or wild-caught (Carrete & Tella 2008)- wild-caught birds who then escape from their confinement or are released are more likely to survive in the wild because they retain the skills needed (such as predator avoidance), while captive-reared birds have often lost those responses. It sometimes turns out that what had seemed like a stable or growing population could not really survive in the wild (budgies intentionally released in the Isles of Scilly, UK formed a growing population for 6 years, and then rapidly disappeared once the person feeding them moved away [Butler 2005]), while other populations which seem like they shouldn’t be able to persist do so (witness tropical monk parakeets living through Illinois winters [Goncalves da Silva et al. 2010]). So what type of scale are we talking about with parrot invasions? It’s pretty impressive, to be honest, and we can largely take the credit for making certain species global personalities. Ring-necked parakeets (also referred to in some literature as rose-ringed parakeets, which was a bit confusing at first) hail from Asia and Africa and are now considered by some to have the largest global distribution of any parrot species (Shwartz et al. 2009) having added at least 35 new countries to their range. Monk parakeets are originally from southern South America, but can now be found throughout the Caribbean, North America, Europe, Japan, and elsewhere (Goncalves da Silva et al. 2010). In 2005, the American Ornithologists’ Union listed 7 parrot species as established in the US (Butler 2005) and there was the possibility of 5 more being added. Where are these birds coming from? The pet-trade, for the most part- whether they are escapees or intentional releases, these species were initially imported into various countries to be kept as pets. Carrete and Tella (2008) estimated that 5-10 million birds (not just parrots) are captured annually for the pet trade. The US had been the largest importer of monk parakeets and other species (64,225 monk parakeets between 1968 and 1972! [Russello et al. 2008]), and, although the Wild Bird Conservation Act of 1992 plus bans on specific species have changed that, Runde et al. 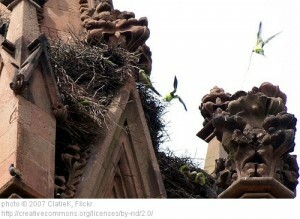 (2007) estimated that around 17,000 parrots are still imported annually. Genetic studies by a number of these researchers indicates that many non-native populations come from pet-trade stock. 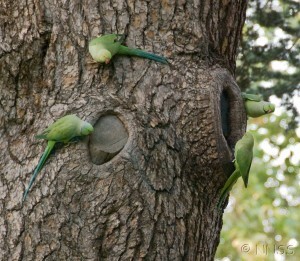 Ring-necked parakeets, now an established population in the UK. Image from the GB non-native species secretariat, under Crown copyright. Are they really causing problems in their new locations? In some respects, that depends on your point of view, but there are (I think) legitimate issues that have to be addressed. For the same reasons that parrots are popular as pets, they tend to have a lot of supporters when they exist in non-native populations- people enjoy watching them and in some cases have been quite protective about these new populations. In a Barcelona survey, 80% of respondents were against control of invasive monk parakeets in the city (Senar & Domenech 2001). Many parrots, however, are cavity nesters and may compete with native species in areas where nesting sites are limited (which is a common situation, by the way, in areas of the developed world because of intensive forest management) (Strubbe & Matthysen 2007). Strubbe and Matthysen (2007) found a negative correlation between parakeet and nuthatch presence- because ring-necked parakeets begin breeding considerably earlier than native nuthatches, they may monopolize breeding sites in the areas where the two species overlap. A similar concern for the echo parakeet in Mauritius (whose status I mentioned last week) led to programs to remove invasive ring-necked parakeets from nesting cavities that could be used by the echo parakeet (Strubbe et al. 2010). As I mentioned above, parrots also consume immature fruit, and seeds passing through the digestive system tend not to be viable- this can lead to changes in habitat plant composition (Neo 2012). And there are impacts that you might not have expected. 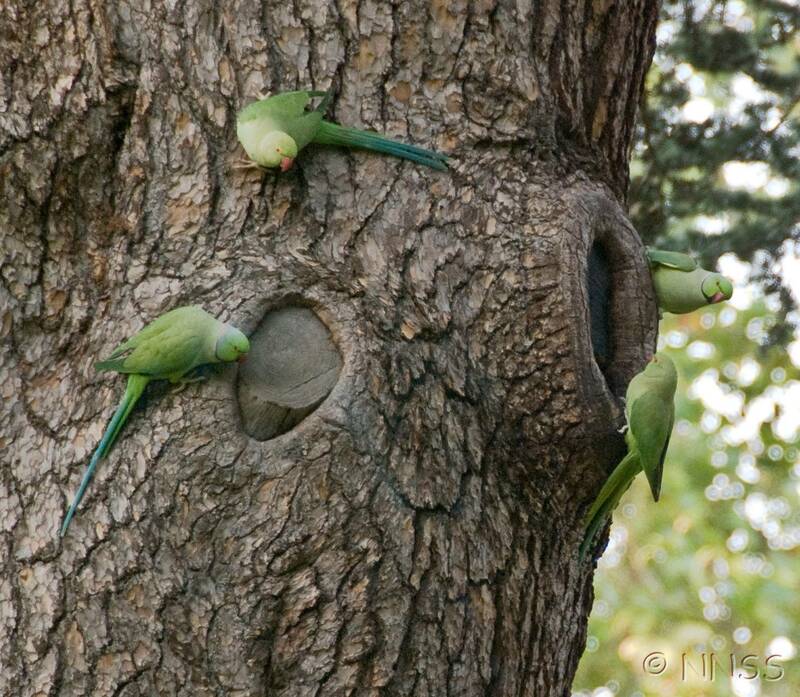 Monk parakeets do not use cavities, but instead construct their own nests which can be pretty elaborate affairs- to do this, they use a variety of branches, some of which are snapped off of trees, leading to tree damage (Conroy & Senar 2009). Because these nests get very big and are usually high off the ground, they pose a danger to anything underneath in windy conditions, and it turns out that monk parakeets like to use metal structures from power grids for support- in 2001, over 1000 electrical outages caused by monk parakeet nests cost around $585,000 in south Florida (Russello et al. 2008). With expanding parakeet populations and ranges, think about what that means for our power grid. So parrots are both in peril and invasive species, which I think, although complicated, is helpful for reminding us that very rarely are environmental situations completely black and white- the global environment is a pretty complicated web and human beings play a very active part in many aspects of that. Because we are involved in so much of how the environment changes, we also have many opportunities to direct or mitigate that change, so for my next post, I’ll look into how we can both support parrot conservation and slow the spread of invasive populations. Butler, CJ. 2005. Feral parrots in the continental United States and United Kingdom: past, present, and future. Journal of Avian Medicine and Surgery 19: 142-149. Carrete, M and JL Tella. 2008. Wild-bird trade and exotic invasions: a new link of conservation concern? Frontiers in Ecology and the Environment 6: 207-211. Conroy, MJ and JC Senar. 2009. Integration of demographic analyses and decision modeling in support of management of invasive monk parakeets, an urban and agricultural pest. In DL Thomson et al. eds. Modeling Demographic Processes in Marked Populations, Environmental and Ecological Statistics 3: Springer US. Goncalves da Silva, A, Eberhard, JR, Wright, TF, Avery, ML, and MA Russello. 2010. Genetic evidence for high propagule pressure and long-distance dispersal in monk parakeet (Myiopsitta monachus) invasive populations. Molecular Ecology 19: 3336-3350. Neo, ML. 2012. A review of three alien parrots in Singapore. Nature in Singapore 5: 241-248. Runde, DE, Pitt, WC, and JT Foster. 2007. Population ecology and some potential impacts of emerging populations of exotic parrots. Managing Vertebrate Invasive Species: Paper 42. Russello, MA, Avery, ML, and TF Wright. 2008. Genetic evidence links invasive monk parakeet populations in the United States to the international pet trade. BMC Evolutionary Biology 8: 217. Senar, JC and J Domenech. 2001. Volaracio dels danys per Cotorra de pit gris al Baix Llobregat I a la ciutat de Barcelona. Museu de Ciencies Naturals, Barcelona. Shwartz, A, Strubbe, D, Butler, CJ, Matthysen, E, and S Kark. 2009. The effect of enemy-release and climate conditions on invasive birds: a regional test using the rose-ringed parakeet (Psittacula krameri) as a case study. Diversity and Distributions 15:310-318. Strubbe, D and E Matthysen. 2007. Invasive ring-necked parakeets Psittacula krameri in Belgium: habitat selection and impact on native birds. Ecography 30: 578-588. Strubbe, D, Matthysen, E, and CH Graham. 2010. Assessing the potential impact of invasive ring-necked parakeets Psittacula krameri on native nuthatches Sitta europeae in Belgium. Journal of Applied Ecology 47: 549-557.